Sila ‘suka’ & ‘kongsi’ poster ini. We are open for registration for our new class “Bidayatul Hidayah” to be conducted by Ustaz Yousef Abdul Rahim based on the teachings of Imam Al Ghazali. Class will be in English. Interested participants please email your inquiries to yusuf@sultan.mosque.org.sg. Please ‘like’ & ‘share’ this post. Click here to view our for the photos of the event. We would like to express our utmost gratitude to those who have joined and made joyous our #guadahrelek 3 programme last night. We would like to hear your feedback for future improvements. Please click the link below to let us know what you think! Photos from Malam Mahabbah, 2 November 2016 (2 Safar 1438H) with the gracious presence of Ulama and Murabbi, Al-Habib Umar Bin Muhammad Bin Salim Bin Hafizh from Tarim, Hadramaut in his Rehlah (journey) Dakwah beliau ke Nusantara. 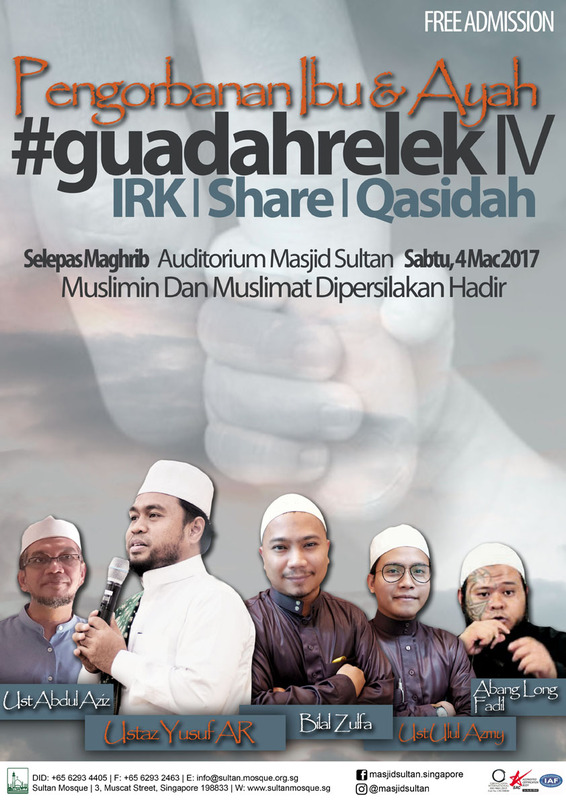 Malam Mahabbah yang diadakan di Masjid Sultan Singapore pada 2 November 2016 bersama Ulama dan Murabbi (Pendidik), Al-Habib Umar Bin Muhammad Bin Salim Bin Hafizh dari bumi Tarim, Hadramaut di dalam Rehlah (Perjalanan) Dakwah beliau ke Nusantara.